I personally found this dress breath-taking. It is custom made lavender chiffon Azzedine Alaia. From other photos, it is short and flouncy above the knees. It's just so different from any wedding dress and so low key Sofia Coppola. I don't know how this woman pulls off being so elegant and classy without trying in the least bit. 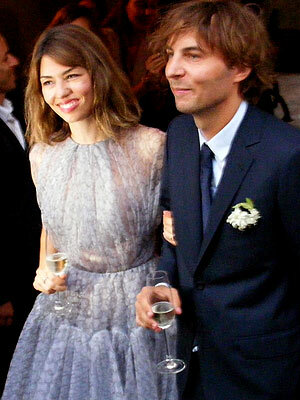 On Saturday, Aug 27 2011, she married Thomas Mars of the band Phoenix in a small, private wedding held in her grandparent's home town Bernalda, Southern Italy.